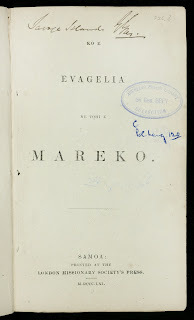 Ref: Ko e evagelia ne tohi e Mareko, p.13, 1861, Sir George Grey Special Collections, Auckland Libraries, 226.3 KOEE. As early as 1849 a Samoan teacher, named Paulo, settled in Niue. 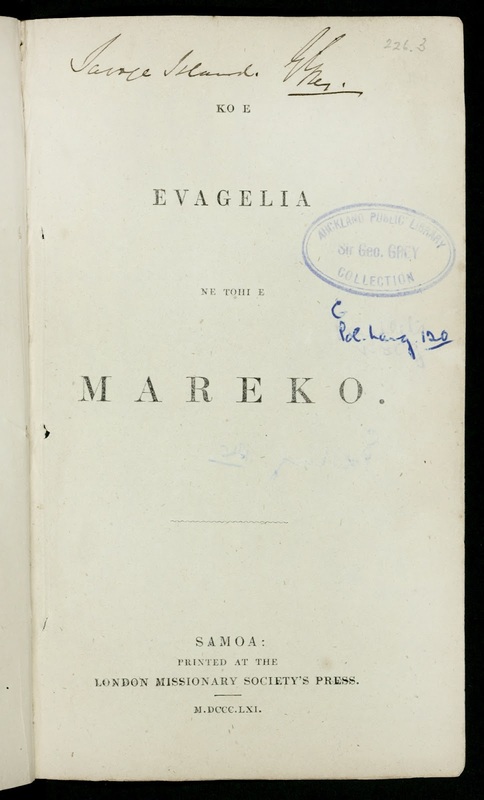 He prepared a version of St. Mark’s Gospel, which was revised by other teachers; and in 1859 the manuscript was sent to Samoa, where it was prepared for publication by G. Pratt, of the London Missionary Society, with the aid of a Niuean student. 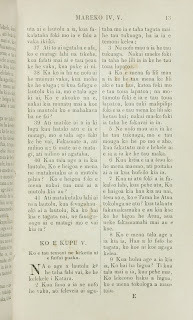 In 1861 the book was printed at the mission-press in Samoa, the paper being supplied by the British and Foreign Bible Society; and in the same year the copies were conveyed to Niue by G. Pratt, accompanied by W.G. Lawes and his wife, the first European missionaries to reside in Niue. The Gospels and the Acts, Philippians, and 1-3 John published in 1863. 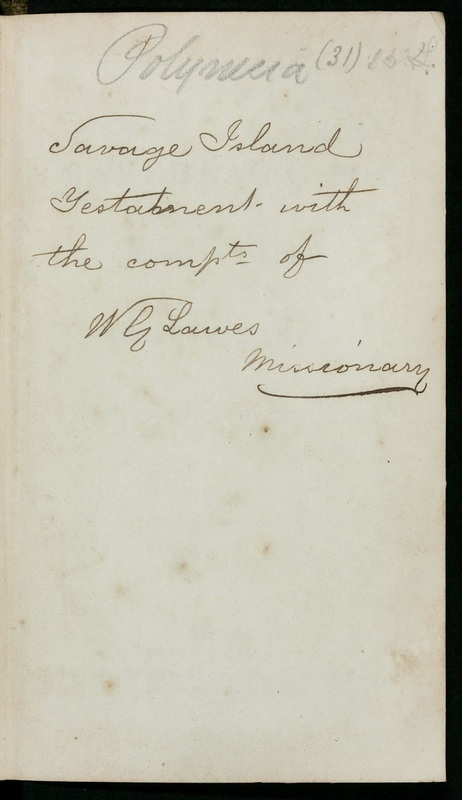 It is interesting to note that this copy is annotated on the flyleaf by the missionary W.G. Lawes himself. 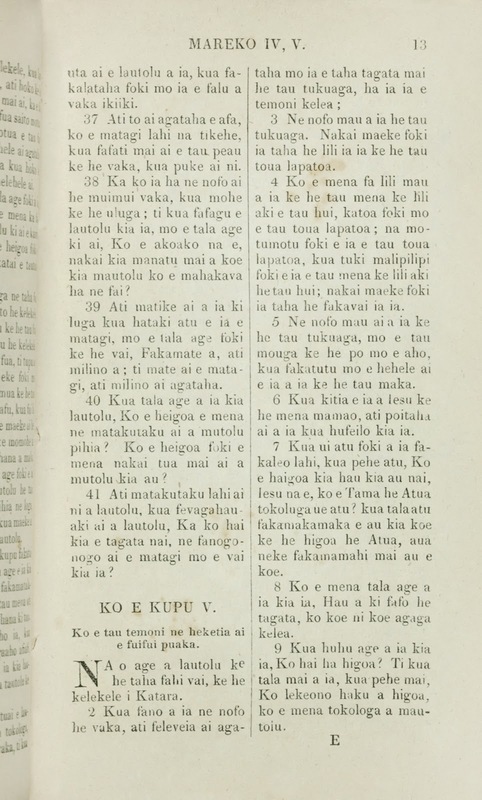 Ref: Ko e Maveheaga Fou he Iki ha tautolu, ko Iesu Keriso, flyleaf, 1863, Sir George Grey Special Collections, Auckland Libraries, GNZ 225.5994 B58. 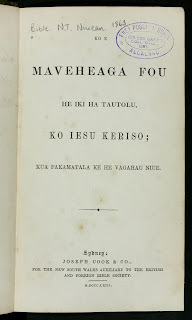 Ref: Ko e Maveheaga Fou he Iki ha tautolu, ko Iesu Keriso, p.1, 1863, Sir George Grey Special Collections, Auckland Libraries, GNZ 225.5994 B58. 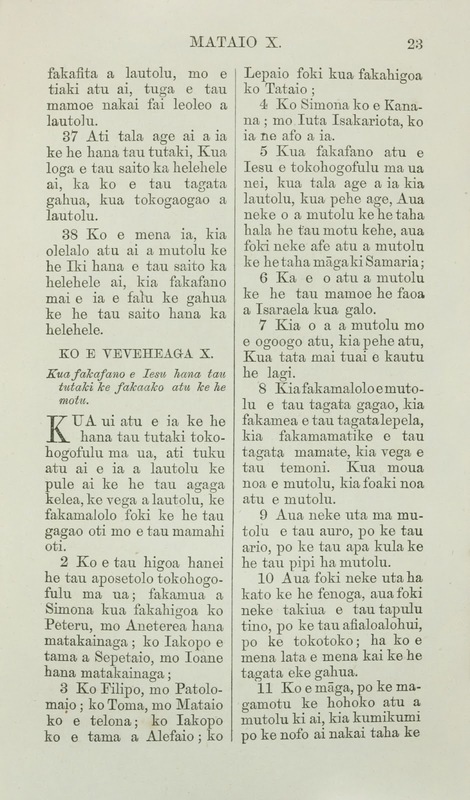 The Gospels and the Acts were translated by Samoan teachers and revised by G. Pratt, who appended a version, made by himself, of Philippians and 1-3 John. 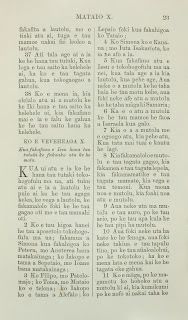 This was printed at Sydney by the New South Wales Auxiliary of the British and Foreign Bible Society, under the care of S. Ella, superintendent of the mission-press at Upolu. 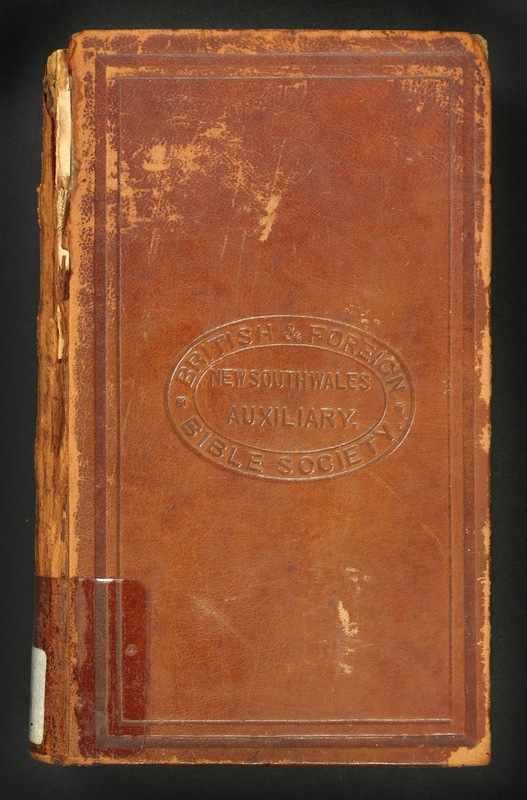 The New Testament, published in 1866. Interestingly, from the description here it appears that the Niueans had to pay for the privilege of being indoctrinated into Christianity. 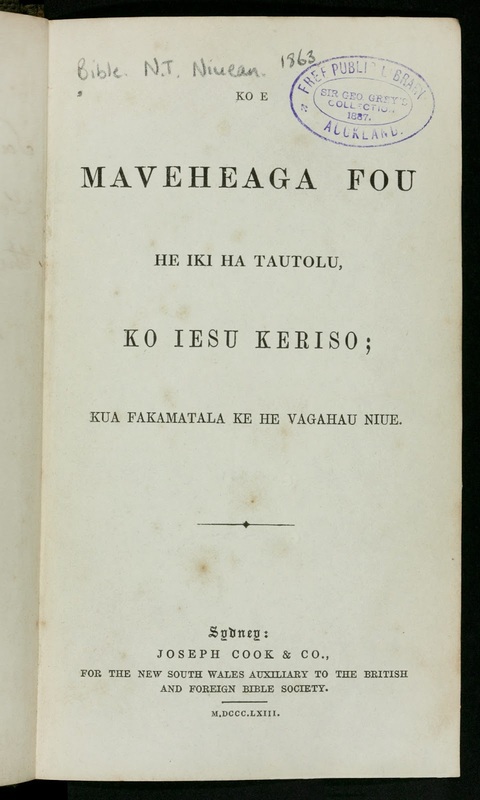 Ref: Ko e Maveheaga Fou he Iki ha tautolu, ko Iesu Keriso, cover, 1866, Sir George Grey Special Collections, Auckland Libraries, GNZ 225.5994 B58. Ref: Ko e Maveheaga Fou he Iki ha tautolu, ko Iesu Keriso, p.23 1866, Sir George Grey Special Collections, Auckland Libraries, GNZ 225.5994 B58. 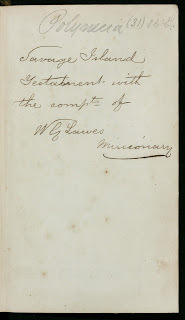 The translation of the remaining books of the New Testament (see the Gospels from 1863) was completed by W.G. Lawes, with assistance from G. Pratt. 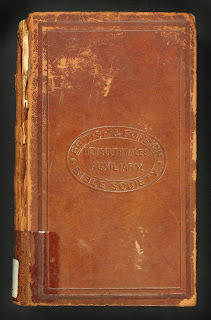 The books already published were then revised, and in 1866 this edition of the whole New Testament was printed at Sydney under the care of J.P. Sunderland, formerly a missionary in Samoa. It received a warm welcome from the islanders of Niue, who had been preparing the coconut fibre, arrowroot, and other produce, in order to pay the full price for their copies of the volume.